The theme of the meeting was Making Choices. We discussed courage and what it takes to stand up and do the right thing when others are pressuring us to do what we know is wrong. We also talked about respecting the environment and reused old newspapers by turning them into swords. 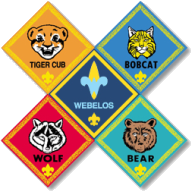 Note: Homework resources including several articles about people protecting the world can be found on the digital bulletin board in Scouttracks. Note: Homework resources such as a blank healthy habits chart can be found on the digital bulletin board in Scouttracks. PS - Sign your photo release forms so we can post uncensored pictures! Friday, September 5 was the super den meeting of the Pack 845 wolves. Both Den 7 and Den 6 participated. 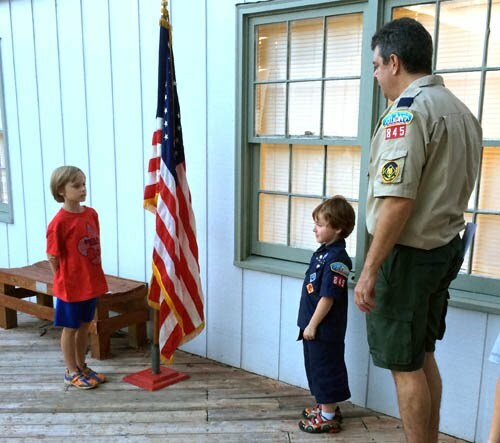 The boys learned about the US Flag, Georgia Flag, and the Pledge of Allegiance. They also participated in a number of flag ceremonies. 2a - Give the Pledge of Allegiance and tell what it means. 6a. Complete the Character Connection for Positive Attitude. Bonus: There is a COLLECTING belt loop and pin you may want to try to combine with this homework assignment.